Seed accelerators or incubators like the Y-Combinator and TechStars have become increasingly popular mechanisms to support startups, offering funding, mentoring and sometimes office-space for founders and their teams. There are hundreds of such programs in the United States and abroad and the number seems to be growing by the day. However, as reported in the Wall Street Journal, a recent report by a Kauffman Foundation fellow, Aziz Gilani, has concluded that most accelerator or incubator programs don’t live up to expectations. In fact, 45% of the 29 North American accelerator programs examined didn’t have any graduates that secured institutional financing. With the notable exception of the top tier accelerators such as Y-Combinator or TechStars, there seems to be a gap in terms of what is advertised and what is actually delivered as value to the startups. Most accelerators simply can’t sit back to cherry pick quality startups already destined for success – they must learn to create value through education, coaching and mentorship for the startups they embrace beyond funding and office space. Some accelerators have chosen to differentiate themselves through regional or industry specialization and or ties to sponsor corporations – this in itself isn’t necessarily a bad strategy but seems insufficient as a lasting differentiator when the cost of starting a competing ‘me-too’ program is relatively low. Corporations also seem to be getting in on the startup accelerator or incubator action – Many corporations have set up their own in-house accelerator, taking a small equity piece of the hosted start-ups in exchange for seed funding, guidance and access to in-house tools and connections. Notable examples include Telefonica’s Wayra (With an impressive worldwide footprint! ), Nike’s Fuel Lab, or Cisco’s new EIR program. Some corporations have chosen to partner with established accelerators (e.g. MS Azure powered by TechStars (Nike’s early accelerator had also partnered with TechStars). The key strategic question here is similar to the external accelerators and incubators – How do corporate accelerator or incubator programs differentiate themselves to attract high-potential candidates from internal or external sources? From my experience with Universities, Government entrepreneurship support programs and major corporations, early stage startups and internal new venture efforts need a lot more besides seed funding, advice from industry expert mentors, office space and access to shared services – they need the proper mindset for taking on high-risk, uncertain endeavors as well as a structured process that encourages search over execution, business model innovation over business plan writing, Minimum Viable Products (MVP’s) over feature-bloated beta products, and pivoting to what customers really want over meeting arbitrary development timelines while producing vanity metrics. This new mindset and process (methods and tools) for creating a startup or new venture effort that delivers what customers actually want has been dubbed “The Lean Startup”. See Steve Blank ‘s article in the May edition of the Harvard Business Review. To teach this new mindset, methods and tools, Steve Blank created the Lean LaunchPad training program, initially taught at Stanford University in 2011, but now offered at dozens of Universities like U.C. Berkeley, Columbia University, U.C. San Francisco, CalTech, SDSU (where I teach it) as well as government entrepreneurship support programs worldwide including the US’s National Science Foundation and Columbia’s Ministry of IT. To ‘train the trainers’ of the Lean LauchPad curriculum at Universities, in partnership with Stanford University, U.C. Berkeley, and Jerry Engel Steve Blank has also created an educator’s program, delivered through a partnership with the National Collegiate Inventors and Innovators Alliance (NCIIA). Based on the success of the Lean LaunchPad educators program (read a recent review here), Steve Blank has started a similar program for executive leaders of seed accelerators and incubators: You can read about it here (LLP for Accel./Incub.). 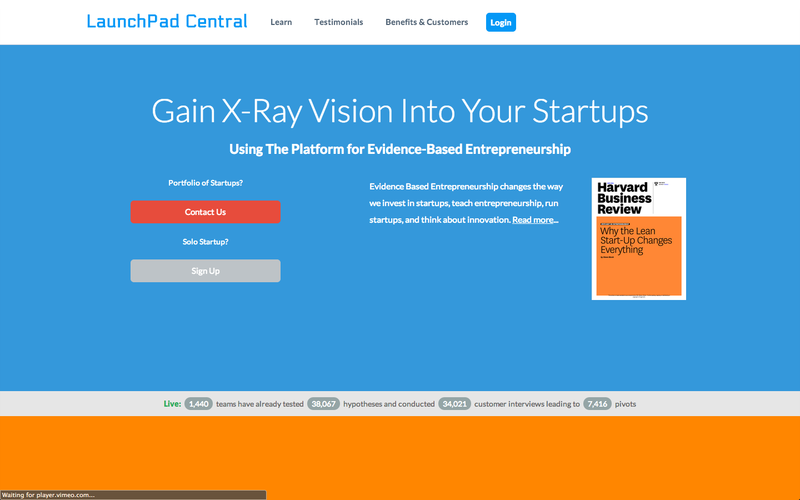 You can read more about the Lean LaunchPad in Steve’s popular and extremely content rich blog. Those accelerators and incubators that take the plunge to train their trainers may also want to consider the accompanying software for evidence-based entrepreneurship. It is a great point that accelerators and incubators need to embed the leading startup practices to their programs. Lean Startup was recognized in a recent Economist (Jan 18, 2014) special section on startups as one reason that we are in the middle of a new startup boom. Lean startup practices simply make it easier to start up a new company. In other words, they work.